I'm still recovering from the holiday blahs, so I'm reprinting here a post that appeared at Novel Adventurers on December 29, 2011. It's a story worth repeating. Who flies across the world on a cold winter night filling children’s stockings with presents? Santa Claus? Well, yes, but not on the night of January 5. That’s the Befana, a good witch adored by Italian adults and children alike. January 6 is Epiphany, the twelfth day of Christmas, marking the arrival of the three Wise Men at the manger with gifts for the baby Jesus. It’s also a national holiday in Italy, marking the last day of the Christmas season. According to an Italian legend, the Magi stopped at an old woman’s hut on the night of January 5, asking for directions to the Christ child. The old woman didn’t know, so they asked her to join them. She told them that she was too busy cleaning her house. Later, when she saw the bright star, she changed her mind and went in search of the manger bearing gifts but didn’t find it. In one version of the legend, she became so distraught at being unable to find the child that she cried. Her tears fell onto her broom, which in her haste she had brought along. The purity of her tears gave magical powers to the broom, allowing her to fly on it. In another version, she has lost a child, perhaps killed by Herod's men who were charged with destroying all newborns to prevent a Savior coming into the world. In her quest, she found the Christ child and thought it was her baby. The baby Jesus was so sympathetic that he gave her broom its magical powers and allowed her to be the mother of all children for one night each year. 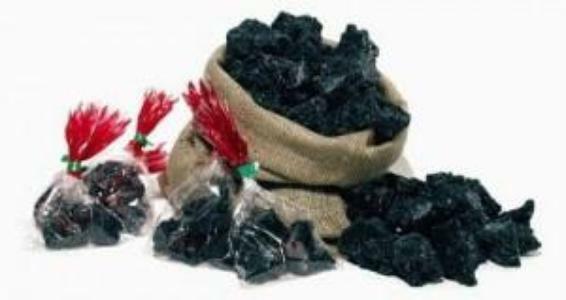 Since then, every year on the night of January 5, the Befana flies all over the world, filling good children’s stockings with presents and candy and leaving lumps of coal for bad ones. Because she is a good housekeeper, she may also sweep a bit. 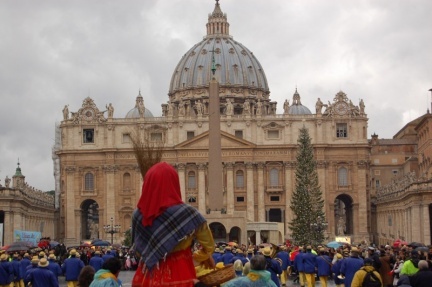 The Befana tradition has existed on the Italian peninsula for centuries, and it may have its origin in an ancient Roman celebration called Saturnalia, which began around winter solstice and lasted for about ten days. At the end of the festival, Romans went to the Capitoline hill to have their augurs (fortunes) read, perhaps by an old woman. The Befana is dressed in old, tattered clothing with a shawl on her shoulders and a scarf on her head. She carries her gifts in a bundle on her back. She’s smudged with soot because she comes through the chimney like Santa Claus (how does his beard stay so white?). Before the children go to bed on January 5, they put out treats for the Befana, including a small glass of wine. 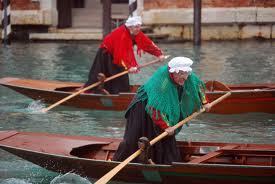 Tradition has it that if you see the Befana, she thumps you with her broom. That may have been an inducement created by parents to get the children off to bed early! Today, there are celebrations throughout Italy both on the evening of the fifth and on Epiphany itself with processions, fireworks, and more. In Vatican City, people in medieval dress march to St. Peter’s with gifts for the Pope; in Venice, the Regatta della Befana is raced on the Grand Canal; in Florence, a medieval parade marches from the Pitti Palace across the Ponte Vecchio to the cathedral. When I’m asked what we do for Befana in America and I say we don’t have Befana, people—old and young alike—are stunned. They shake their heads in wonder. No Befana! How can that be? I hope you'll join me next Thursday for Novel Adventurers. Next week, we're writing about "Bodies of Water." fascinating. And I vote for Belfana! It's an amazing holiday. Right now, shops are stocking candy for the stockings, and that candy coal is out there, too. People actually put small brooms on their doors instead of wreaths during the Christmas season.